Located conveniently on the English Harbour main road in Falmouth. Falmouth Harbour Marina has been specifically built to cater to larger yachts, with dockage for vessels with a draft of up to 18' both stern-to and alongside. Set in the heart of Falmouth Harbour, facilities are within easy walking distance - with shops, bars and a variety of restaurants nearby. 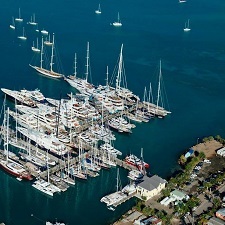 Extensive marine facilities include marine engineering, electronics and rigging together with a sail loft, dive shop and chandleries - to provide a complete service for the yachting industry. 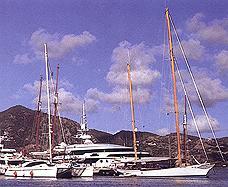 Marina facilities include: 30 stern to berths, 30 berths alongside, 21' maximum draft. Electricity (110, 208 and 380-3 phase volts), Water, Public tele-card telephone, Fuel, Security and Parking, Garbage disposal, and toilets on site. Please visit our website or contact us today for more information on berthing rates and services.